Back pain is one of the most common health conditions in the world – you’d be hard pressed to meet anyone who hasn’t experienced it. No matter if it feels dull, sharp, achy, shooting, or stiff, living with back pain can really wear you down over time. It can affect your ability to work, drive, exercise, and maintain healthy relationships. What many people dealing with back pain may not realize is that there are habits and lifestyle choices they can look at changing in order to help themselves find relief. Not exercising enough – exercise is one of the best methods of natural pain relief because it’s one of the best ways to release endorphins. Endorphins are your body’s natural pain-killers. 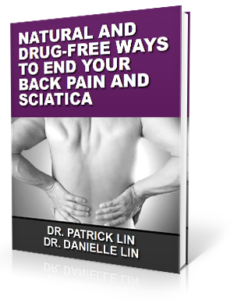 When they’re released, they help to block pain signals, reduce anxiety and depression, and alleviate stress – all of which can lead to the reduction of back pain. Not taking the time to apply ice/heat – ice and heat can be very therapeutic for back pain. Ice is typically used for new, acute injuries and pain in order to numb the pain and reduce inflammation. Heat is usually good for easing chronically sore, tight muscles since it stimulates blood flow which provides nutrients needed for the healing process to occur. Skipping core-strengthening – your core and your lower back are intimately related. Weak abdominal muscles are not able to give your lower back the support it needs. There are simple ways to add core strengthening into your daily life, for example, you can opt for sitting on an exercise ball rather than a chair. Holding a proper plank position is also a great way to build core strength. Not getting enough sleep – your body does much of its healing and repair during the night. A lack of restorative sleep can be part of a vicious cycle when it comes to getting rid of back pain. Often, pain causes poor sleep quality and a lack of good quality sleep doesn’t give your body the opportunity to heal. Forgetting to stretch – muscles can become tight and shortened if you don’t take the time to stretch. An overlooked cause of back pain can be tight hamstrings. Your hamstrings, which run the length of the backs of your thighs, attach to the “sit bones” of your pelvis. If they become tightened, it can flatten the natural curve in your lower back, causing strain on the sacroiliac joints (SI joints) and lumbar spine. You haven’t quit smoking yet – the nicotine in cigarettes reduces blood flow to the discs in between your vertebrae. The discs are cushions that help to absorb the day-to-day forces that your spine endures. As the discs begin to degenerate due to lack of nutrient delivery, it can cause back pain as well as an increased risk for osteoporosis, bone fracture, and slower healing. Not getting enough sun – your body synthesizes vitamin D when your skin is exposed to natural sunlight. Vitamin D is an essential nutrient for bone and muscle strength because of its role in calcium absorption. Since the majority of people don’t get enough sun exposure to maintain healthy levels of vitamin D, taking a supplement might be appropriate. Not making time to do things that bring you joy – when it comes to back pain or even pain in general, your mind can be a powerful tool. Your brain is the interpreter of pain signals and controls your perception of pain. Chronic pain can seep into every aspect of your life, so it’s important to find time to engage in relationships and activities that make you happy. This is another way that your body can produce and release endorphins, naturally reducing pain levels. Many back problems can be traced all the way up the spine to the vertebra that sits at the very top of the neck. Your atlas (C1) vertebra sits where the neck meets the skull. It is uniquely shaped in order to hold the head up and also allow for its wide range of movements. Since the atlas is the most freely movable segment of the entire spine, it can also be vulnerable when it comes to injuries, accidents, and wear-and-tear. When the atlas misaligns, it forces the head out of its natural, neutral position. In an effort to keep the head centered and balanced, the rest of the spine must compensate. Along the length of your spine, muscles can spasm, ligaments are strained, joints can be stressed unevenly, and nerves can be irritated. By addressing the positioning of the atlas, upper cervical chiropractic is able to get to the root cause of back pain. At Symmetry Health Chiropractic center, our focus on upper cervical chiropractic care has helped people suffering from neck and back pain find natural, lasting relief. Precise measurements are taken for each patient so that we can provide the most precise, gentle adjustment possible in order to restore normal alignment. When the upper cervical spine is aligned, the rest of the spine is allowed to return to normal as well. If you suffer from back pain, a gentle adjustment to the top vertebra in the neck could be a big step towards better health.